Earlier I showed you that the daughter of Fred Phelps, founder of Westboro Baptist Church was in court and we explained who the Westboro cult was, the things they did and I asked if some of those things weren’t considered child abuse. Today we see reports that the daughter of Fred Phelps, Shirley Phelps-Roper, is in court today asking a Sarpy County judge Monday to order prosecutors to spell out in writing why she is charged with flag mutilation, negligent child abuse, contributing to the delinquency of a minor and disturbing the peace. They say the details of those charges will be important to Phelps-Roper’s defense. 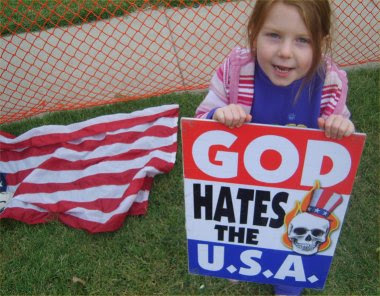 Thanks to Jay at Stop The ACLU because he found this heartbreaking video of what Westboro does to their children. I ask the same question. Is this not child abuse and brainwashing? My heart breaks for these poor children. After the Father, Albert Snyder, of a slain Marine, Lance Cpl. Matthew Snyder, decided to take the Westboro cult disguising themselves as a church, to court for invasion of privacy for disrupting them while they were trying to bury their hero son, a slain Marine, we brought you news that the father won the landmark case and was awarded $11 Million dollars in damages. You can see what type of site these Westboro freaks run called God Hates Fags (Site now says the Domain is invalid) and you can hear the insane Fred Phelps throwing a hissy about the judgment (video at that link) when he was interviews by Rick Sanchez. Security was tight today as Westboro Baptist Church member Shirley Phelps-Roper appeared in Sarpy County Court to answer charges that she mutilated a flag and put her child in danger while protesting at the funeral of a Bellevue, Neb., soldier. Although the Sarpy County Sheriff’s Office prepared for a possible protest by members of Topeka-base Westboro Baptist Church, none materialized. A few family members and her attorney accompanied Phelps-Roper, 50. According to Bellevue police, Phelps-Roper had her 10-year-old son stomp on an American flag. Church members had obtained a city of Bellevue permit to protest. 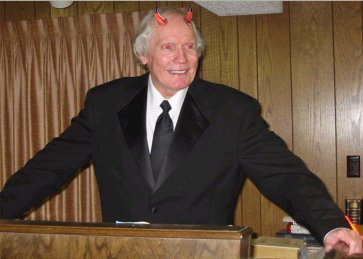 The church, founded by her father, Fred Phelps, has protested across the country at the funerals of numerous soldiers, alleging that their deaths were God’s retribution for America’s toleration of homosexuality. Last Wednesday, a Maryland jury awarded nearly $11 million to a man who sued Westboro Baptist for invasion of privacy after its members protested at his son’s funeral. The pretrial hearing centered on a defense motion requesting that the prosecution describe in detail the specific facts that support the charges, which include disturbing the peace, contributing to the delinquency of a minor and negligent child abuse. Her attorney, Bassel El-Kasaby, argued that without specifics on what actions broke the law in each case and who was victimized he can’t prepare his case. “I don’t think you can disturb the peace of a police officer or firefighter,” he said. He said it was “unorthodox” and potential “overreaching” by prosecutors to charge Phelps-Roper with contributing to the delinquency of a minor and negligent child abuse. “I’d like to know who the victim is and what harm they suffered,” he said. He said if the flag mutilation charge is found unconstitutional, the other charges likewise may be dismissed, but he needs to know the relationship between the charges. Deputy Sarpy County Attorney Marc Delman resisted El-Kasaby’s request, saying he didn’t want to limit the basis for the charges. Delman told the judge that Phelps-Roper had “cleanly, openly and notoriously” made her son step on an American flag while her church protested at the funeral of William Bailey. “Clearly the Bailey family was very upset by this,” he said. Delman said Phelps-Roper’s contempt for the flag gave rise to the case, but the rest of the charges stemmed from other actions as well, including slogans on signs and other conduct. Phelps-Roper, outside the courtroom, said she didn’t force her son, Jason, to do anything. She said he has grown up attending protests and acted on his own. “He laid it on the ground, and he stood on it. And he stood there peacefully,” she said. Sarpy County Attorney Lee Polikov says each charge stands alone, from desecrating the flag, to exposing children to this type of environment. Phelps-Roper’s attorney. Bassel El-Kasaby, seems to be constructing much of his case around a 1990 U.S. Supreme Court ruling allowing flag burning as protected free speech. Lee Polikov doesn’t buy it. When I showed pictures of the signs the children were forced to carry while this cult protested at military funerals, I asked if this was mental or emotional abuse. They have children spewing this hatred…. is this emotional and mental child abuse? 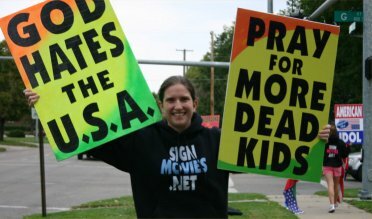 They even hold signs praying for more dead kids. I am glad I grabbed a couple of the pictures from the site because now, all the URL’s for that site are saying it is not a valid Domain. Wonder whats up with that? I truly hope that any family they harass takes action against them. These families have suffered enough and should be permitted to bury their loved ones in peace. I cross posted this at Stop the ACLU. HUGE HAT TIP to Jay at Stop the ACLU… he found Shirley Phelps-Roper’s YouTube page!!!! Last but not least, take a look at this six minute video showing the abuse Westboro puts their children through.